When the Fairmount Park Conservancy first dreamed up the Hunting Park Revitalization Project, it was exactly that, a dream and an ambitious one at that. But that’s the great thing about the Conservancy. They dream up the ways the City could be and the ways the City should be, and they make it a reality. The Conservancy fully believes that parks can be a catalyst for positive change in communities and the lives of those who surround them. 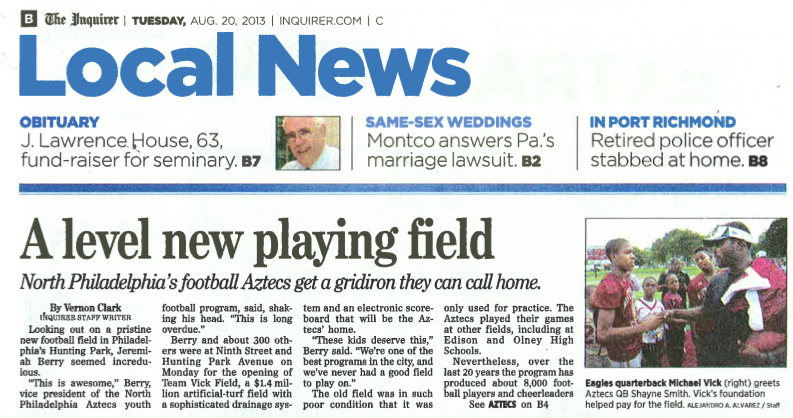 This mission led the organization to dream up, plan, secure funding for and launch the Hunting Park Revitalization Project, a multi-million dollar, long term endeavor to restore the 87-acre Hunting Park in North Philadelphia. Since the project’s start in 2009, LevLane has been working to promote the good work happening in the park through media relations and event management. 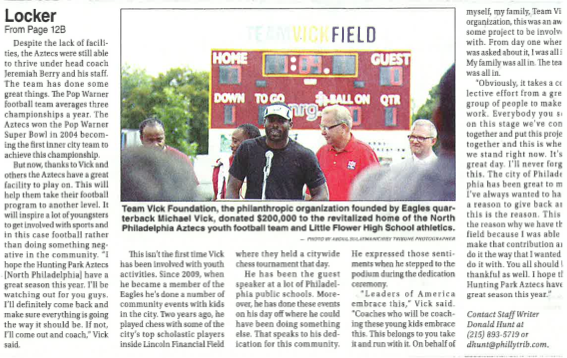 Some highlights from the project have been dedicating a new baseball field with Ryan Howard, new tennis courts with Billie Jean King, a community garden, two new playgrounds, weekly farmers’ market, improved park lighting, a healthy concessions initiative and most recently, dedicating the crown jewel of the park, the brand new Team Vick Field with Michael Vick and Ron Jaworski. 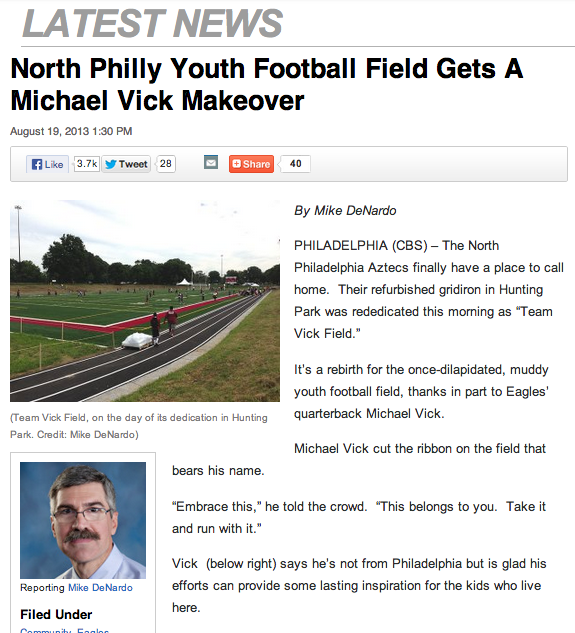 The dedication of Team Vick Field was more than just the excitement of having both 7’s in Hunting Park, it represented the revival of a once-divided community. 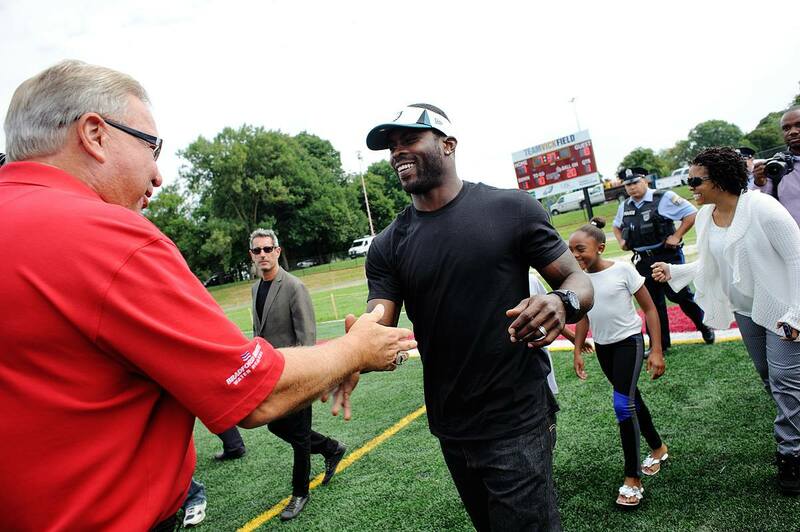 Joined through the Hunting Park United community group, residents and friends alike were finally able to watch their championship Pop Warner youth football team run around on a field with turf (and without broken glass and dirt). 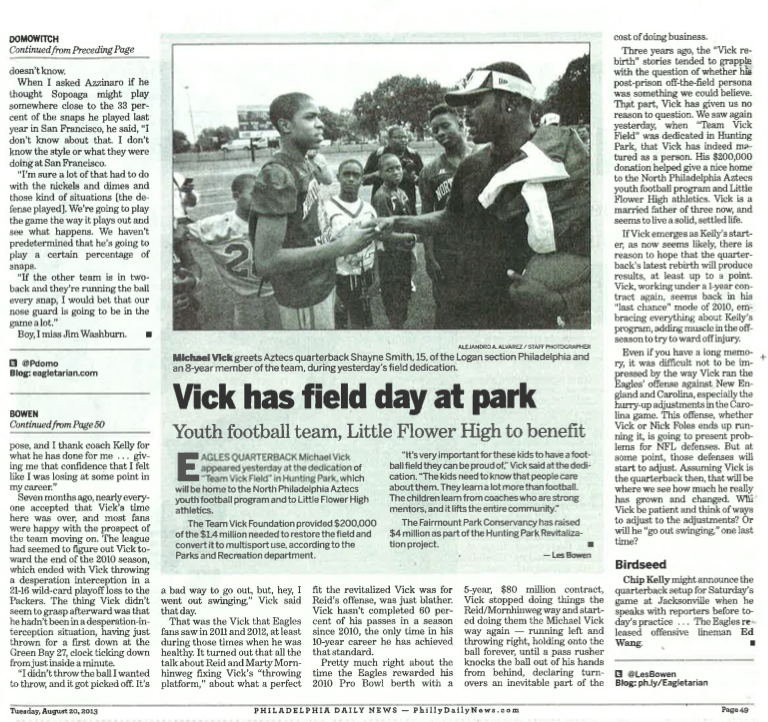 Through aggressive media relations, the Hunting Park football field dedication and in turn, the Fairmount Park’s Conservancy’s tireless effort in Hunting Park, was covered in more than 50 print, broadcast and online stories that garnered more than 58 million media impressions. Touch. Down. To keep up with the Hunting Park Revitalization Project, check out the Fairmount Park Conservancy’s website. Photo credits belong to Albert Yee. On October 16, three LevLaners took a trip up north to that “other city” for a day of learning at PR News’ Digital PR Summit. Emily Verna, Public Relations Account Manager and Erica Nardello, Social Media Manager were joined by Scott Tattar, SVP of Public Relations and CSR to learn about social media, reputation management, SEO, measurement, and leadership. Ms. Nardello, our social media wiz-kid, recapped the summit and identified the key takeaways for the rest of us. So, without further ado, take it away Erica. 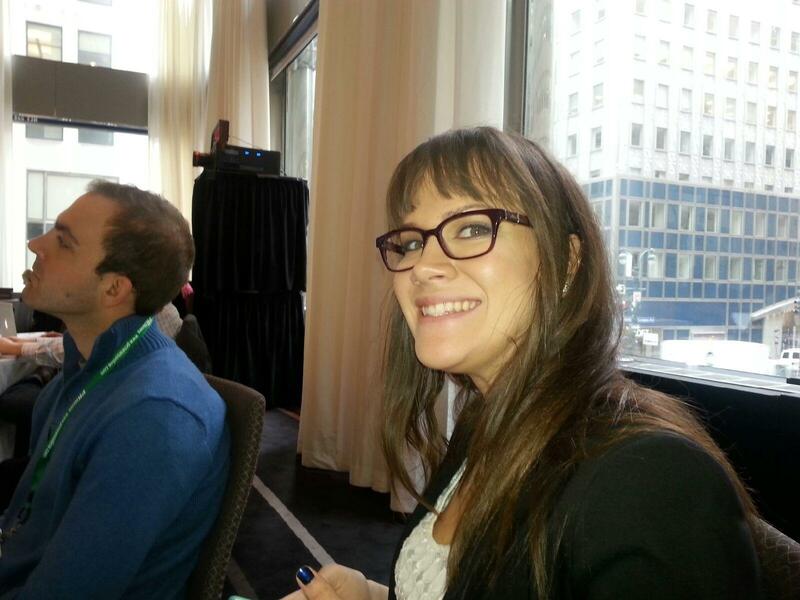 Yesterday, I joined two of my fellow LevLane-rs for a little learning about social media, reputation management, SEO, measurement, and leadership at PR News’ Digital PR Summit in New York City. After searching the Grand Hyatt’s digital agenda and map to find our conference location, we briefly considered trying to join the Super Bowl’s planning meeting before grabbing a quick muffin and our seats in the ballroom. For the most part, the speakers had great experiences to share and insights from which we could all learn. The most important takeaways for me, as a Social Media Manager in an agency, can be found below, in both narrative and infographic. This conference recap is not exhaustive, obviously – I want to be “at the table, not on the menu,” as American Traffic Solutions‘ SVP of Public Affairs and Marketing Communications Charlie Territo so eloquently put it. 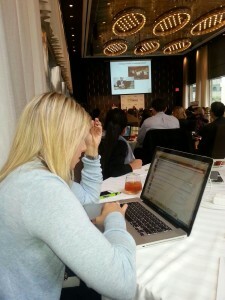 If you were in attendance for #digitalpr, I’d love to know what you found most valuable. Let me know in the comments! In this session, EVP, BurrellesLuce Johna Burke cited a rather groundbreaking statistic from Nielsen: In the past, brands had to communicate messages 3-6 times in order for them to really sink in with consumers. Later, that number increased to 8 times. Today, with the message, platform, and product clutter that defines our lives, brands must reach millennials 23 times in order for brand messages to resonate. Whoa. One of my favorite quotes of the day came from Brooke Primero, SVP, PR & Marketing for the Academy of Country Music. She said, “The kiss of death in social media is being a 9-5, Monday-Friday brand.” No matter what brand you’re promoting, social activity doesn’t sleep and it certainly doesn’t stop because it’s 6:30PM on a Tuesday. The Academy of Country Music’s biggest push of the year is for a 3-hour awards event once a year. That’s it. 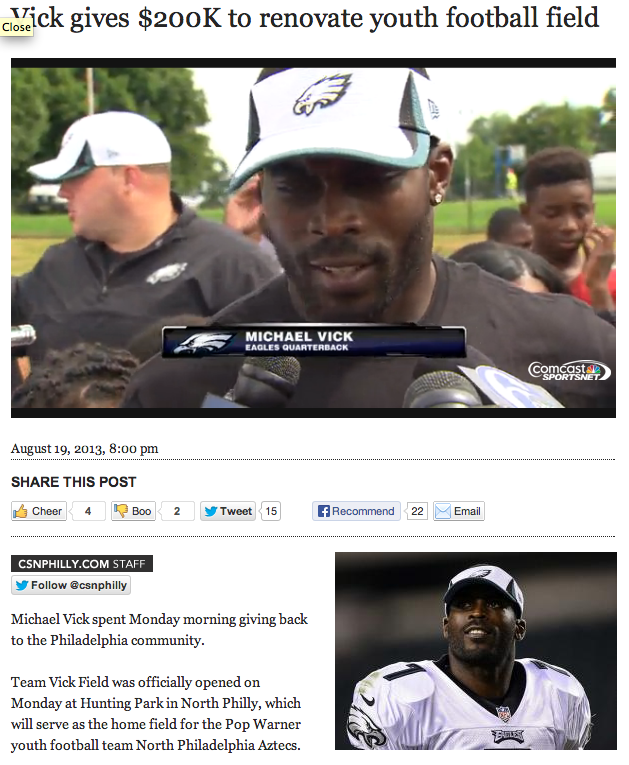 So they focused their efforts on building that brand during the rest of the year via social channels. In 2011, they announced their award nominees on TV, reaching 3 million people, according to CBS. In 2012, they took to Twitter to announce the nominees and reached 14.2 million people. Those are some pretty amazing statistics, but the Academy of Country Music didn’t stop there. They engaged with key influencers to grow across Twitter and gave them behind the scenes access to content to take them from influencers to brand ambassadors. If there’s one thing I learned during this session, it’s this: some people just don’t get reddit. Half of this session was spent listening to the great brand integration stories about reddit, and the other half of the session was spent trying to explain what reddit is. My life, in that moment, was r/reddit. Still, it was interesting to hear Marta Gossage, community operations manager, and Victoria Taylor, director of communications, distinguish reddit from other social platforms: Platforms like Facebook and Twitter show off your “frontstage behavior” (the way you want to portray yourself to the world), while platforms like reddit show off your “backstage behavior” (the way you think and feel when you’re eating potato chips by the fistful in your sweatpants, reading the AMA with a guy who lost 300+ pounds through extreme starvation). reddit seems to be a much more authentic platform in that way – and redditors keep it that way. At the table we shared in the back, Gossage described reddit as having its own immune system. If there’s a foreign body in there, the community reacts strongly to defend its territory (…er, place on the interwebz). Plus, if all else fails for you on reddit, you can always end a post with “…and here’s a picture of my cat” to help you get your footing. If you’ve been trying to figure out how to build a brand presence on one of the more visual social platforms, this was a great session for you. Amanda Junker, digital director for Shape Magazine, spelled out how to drive better results and greater brand relevancy through SEO on Pinterest. Her tips? Display the “Pin It” button prominently on your web properties, verify brand accounts, complete the “About” profile section, name all pinned graphics appropriately, and create boards that capture long-tail searches. She also recommended infogr.am, which I used to create the infographic below. After her part was over, Allison Robins, Director of Global Public Relations at Zumba Fitness, stepped up to discuss Instagram’s power and limits. 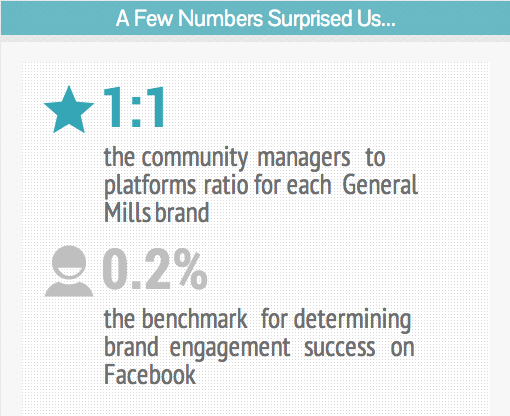 According to Robins, Instagram is not the best pltofrms for brands focused on ROI, conversions, and sales. Instead, it’s better for brand and relationship building. And if you’ve been wondering how to upload pre-recorded videos to Vine, Doug Simon, President & CEO, D S Simon Productions, was your guy. Simply edit your video in a program like Final Cut and convert it to an H.264 mp4 file, compress it, email it to yourself, then upload it to Instagram or Vine. It’s that easy! 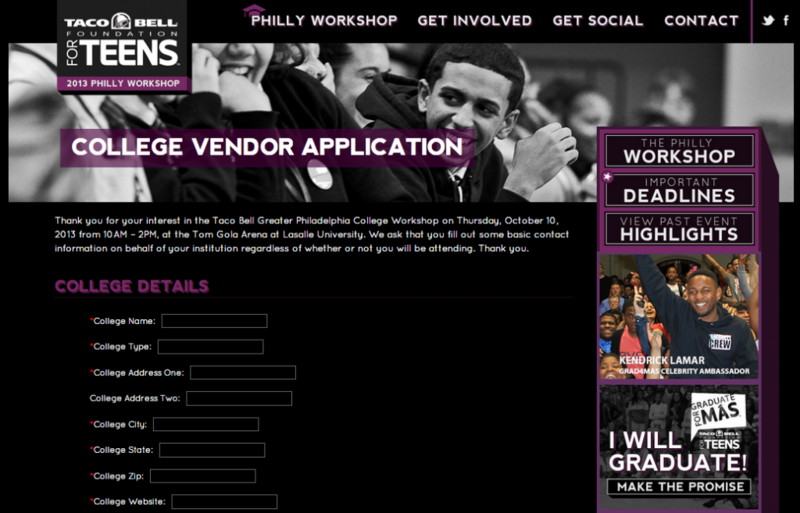 Hands-down, this was the most valuable part of the day for me. Gemma Craven, EVP, NY group director, Social@Ogilvy, explained exactly how the growth of digital and social has shaped the creation and make-up of agency and client teams. Some of these teams may be as large as 20 people, handling digital and social creative, strategy, community management, analytics and listening, production, and more. More than metrics, more than C-suite buy-in, this is what I feel is the most important piece of the digital and social puzzle for agencies and brands today. 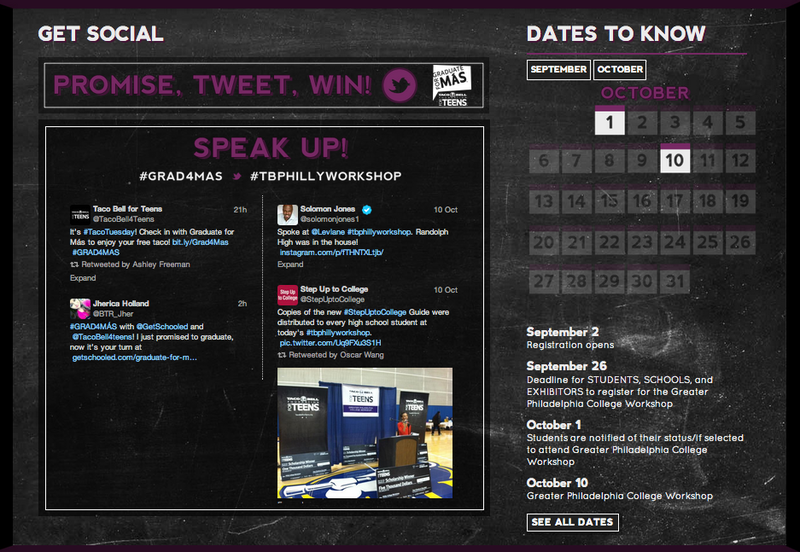 Erica’s recap and full infographic can also be found on her blog, ‘ello.